game against Siena on Friday, March 8, at 7:30 p.m.
Students were able to secure their spot by emailing Booster club by Thursday at noon. My friends and I got our confirmations by Tuesday, and were excited for the game! We met the bus at McAnn Friday afternoon, and enjoyed the movie “Flight” on the bus ride. It was perfect timing, because the movie ended just as we were pulling up to the Mass Mutual Center. We were greeted by a MAAC employee, who escorted us through the Mass Mutual Center to our own huge conference room, where we got free pizza, sandwiches, and drinks. There were also plasma screens set up with Xbox games where students can play as Marist in basketball. 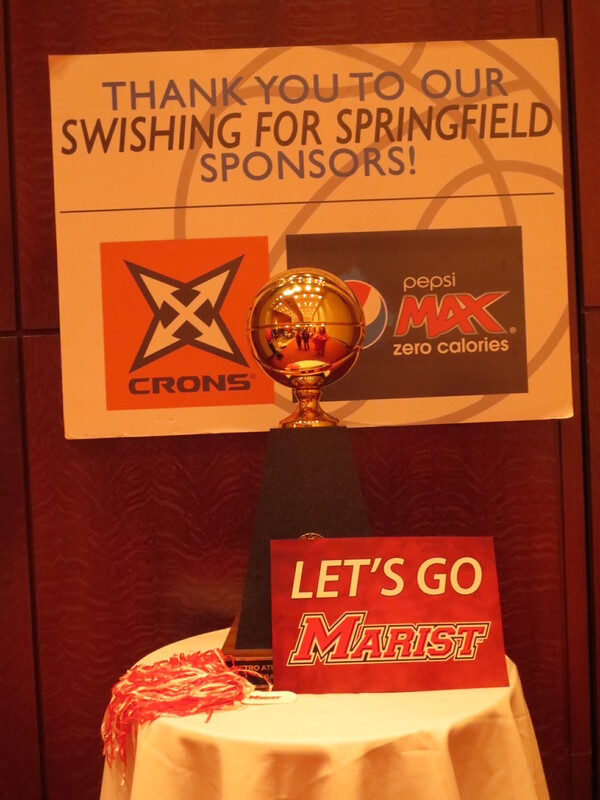 We also got a free T-shirt, and pom-poms, and Go Marist signs. Ready for the game, we were shown to our own section in the arena. It was amazing to see all the support and pride Marist College showed for our team. The band, cheerleaders, Dance Team and Shooter were there. I also waved and said hello to the President of Marist, Dr. Murray. I screamed and cheered on the Men with my friends for the entire game. It was a close and exciting game; Marist was tied 60 – 60 to Siena in the last few minutes. Although Siena ended up winning, it was an awesome experience to a part of the Marist family rooting for our team. The game was worth the trip to Massachusetts, even more so because it was FREE! Thanks Marist!